The ever elusive Celestial Empire of Anne Street. From what little knowledge we have, it would appear to have been a beer shop. These were the forerunners of the public houses we know today. It was situated on the north side of Ann street. Rumour originally suggested that it may have taken over from the old police station building. The station expanded eastwards, but research by Martin Snow now seems to suggest that it was in fact built next door, the area coloured pink in the map below. 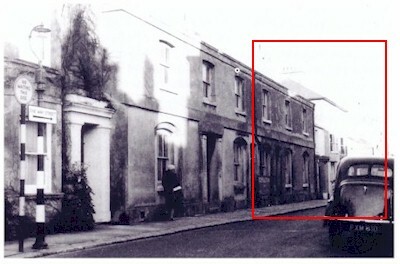 The picture on the left is of the north side of Ann street and the area marked may, or may not, show the building. 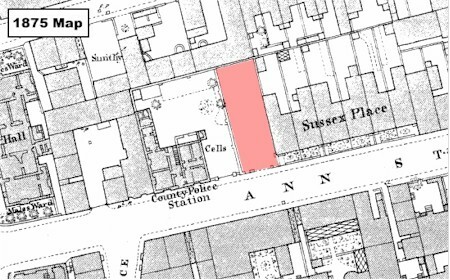 The map dates to 1875 and the plot is shown as vacant and empty. William Carter is listed as the landlord in 1840. We are aware that the Celestial Empire was briefly mentioned in volume 15 of the Sussex County Magazine in 1941, by Arthur Becket. We do know that part of the text is as follows: " . . .gone and left no trace, the Crown in North Street, and the Fisherman in Paragon Street, And what is left of the delightfully named Celestial Empire beershop which could have been found in Anne Street in 1840?" We have yet to find a copy to see what the original article was about.